The not-so-boring book blog for 'tweens! People recoil from me as I navigate the hallway. Not the freshmen so much - they don't know jack about social dynamics. But all the upperclassmen avoid me. I can distinctly hear the word "cursed" being whispered. The Descendants either know how I was made fun of with that word at my old school, which means they're really putting effort into making my life difficult, or it's a coincidence, which is creepy in its own way. I honestly don't know which scenario is worse. Samantha Mather is a sassy loner who moves to the infamous town of Salem. Her father was admitted to hospital in a coma not long before and her relationship with her stepmother Vivian is at its worst. Then she meets Jaxon, who is kind and VERY cute. She also discovers a spirit within her home, Elijah. He is also super handsome, despite being from centuries ago. But problems arise at her new high school and they involve a strange group of teens named the Descendants. Their ancestors were convicted and hung at the Salem Witch Trials back in 1692-93 and they are after revenge. Sam is to be their new victim. When I started this book, I had hardly any knowledge of the Salem Witch Trials and wasn't really interested; however just a few pages in, I was hungry to learn more. 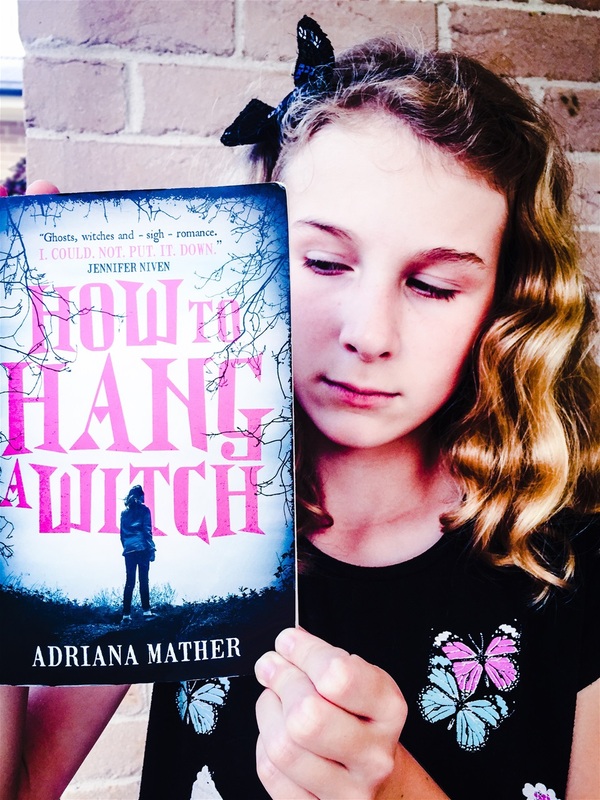 The author, Adriana Mather is actually descended from Cotton Mather, who is considered to be the instigator of the shameful Trials. There are flashbacks and visions throughout the story. Sam, the main character, appears as Cotton. I really enjoyed How to Hang a Witch. This is a dark story but it is balanced with romance. It is violent, descriptive and probably more a YA book than 'tween. Firstly, it has swearing. In basically every chapter, there is bad cursing. This is a sign that it is not for young children. Secondly, there is love. Jaxon flirts with Sam and they kiss (or nearly kiss) multiple times. Sam also kisses Elijah, a ghost. Thirdly, this entire book is about a sinister chapter in Salem's history. Though this isn't set back in the time of the Salem Witch Trials, it is the modern-day version. Sam has a vision of a friend being hung. A classmate is killed and there are grisly details of people dying; obviously, this book is not for the faint-hearted. To be honest, I was sometimes confused by the deep plot. I even considered restarting the book! It has a brilliant and unexpected twist at the end. How to Hang a Witch is an amazing story. It is even on The New York Times bestseller list, which is definitely something to be proud of. I recommend this book to kids aged 12+ and give it five bookbolts out of five.